The King: There he was Saturday night, “the king of the world,” all six-feet-two of Jim Cameron, bathed in love and applause from the Arlington audience and getting a hug from his buddy, the king of California, Gov. Arnold Schwarzenegger. 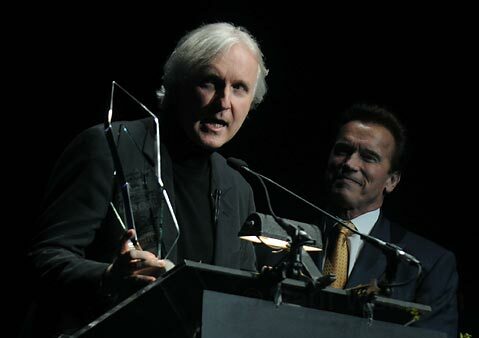 Schwarzenegger, joking in his fractured English that “I’m still struggling saying the word Avatar,” the title of Cameron’s hit sci-fi film, presented the filmmaker with the Santa Barbara International Film Festival’s highest honor, the Lucky Brand Modern Master Award. And in Cameron’s case, the people love what he does too — Avatar has become the highest grossing movie of all time, beating out the former champ, Cameron’s own Titanic. During a Q & A session with moderator Leonard Maltin, Cameron offered this advice to would-be moviemakers: “You have to have something to say,” explaining that film school is fine, but you have to learn “from the school of life.” And, he said, “You have to create your own luck. You have to bang on doors,” but also be prepared to deliver when the opportunity comes along. “Good films are personal films,” said Cameron. “A big film like Avatar is a personal film for me.” He recalled how after the 1969 channel oil spill Santa Barbara was “ground zero” in leading the environmental movement. “I applaud that,” he said, to the applause of the audience. “My wife and I have had a place here for 11 years.” They also live in Malibu. The buzz is that Cameron has optioned as a possible film project The Last Train from Hiroshima: The Survivors Look Back, a nonfiction book by Charles Pellegrino. It deals with the atomic bombing of Hiroshima and Nagasaki in Japan at the end of World War II. Earlier in the day, during the screenwriters panel at the Lobero, Santa Barbara native Jason Reitman said he’d been working on and off on what turned out to be Up in the Air for seven years. Adapting a book, as he did, can be like “you’re stealing somebody else’s genius,” said Reitman, who also directed the Oscar-nominated film. Would-be writers in the audience might have taken other lessons from the opening night film Thursday, Flying Lessons. It bombed on all counts, which may help explain why no one has agreed to distribute it. But the pre-screening party across the street at Café Buenos Aires was a hit, benefiting Casa Esperanza Homeless Shelter and highlighting Food Channel star Cat Cora, a Santa Barbaran.